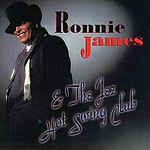 CD review: "Ronnie James & The Jez Hot Swing Club"
This review first appeared in the March 31, 1995 issue of the North County Blade-Citizen (now North County Times). Guitarist Ronnie James has created a highly stylized tapestry of nightclub jazz that swings like crazy on this album. Fronting a small combo that features vibes, trumpet, clarinet and sax, James' fat, hollow-body guitar alternates between syncopated rhythmic comping and his thoughtful solos. If at times this album becomes so stylized as to approach schmaltz, it's always saved by James' impeccable taste and solid arrangements. While a fine guitarist in the old-school big band style, it is James' silky smooth vocals that do more to help create the nightclub ambience found here. Somewhere between Bob Dorough and Mose Allison as a singer, James displays a worldwise humor that lends a certain grounding to this session. The whole band is solid and captures the feel of a 1940s' swing combo. Trumpeter Stan Slotter's muted playing could have come right out of the Cotton Club; bassist Doug Kirschner and drummer Michael Fiocca lay down the relaxed beat. All of his originals fit in perfectly with the era covers like "Sweet Georgia Brown," Basin Street Blues" and "I Can't Give You Anything But Love."